As a dentist you have the ability to help people around your city improve and maintain their smiles, which many of us know that a healthy smile can lead to a growth in overall confidence. In addition to running your practice, there may be social causes that reach beyond your office walls in which you want to partake in. Not only is this encouraged because your practice will benefit due to your community outreach but on a personal level, you will feel more fulfilled that due to your success as a business owner you have been able to extend a helping hand to those in need. You may be wondering where to start or what sort of communal outreach will be more effective for you to influence a larger audience. But it’s not always about how many people you can help or how much you can donate at once – it is important to remember that every little bit helps and can make a change. 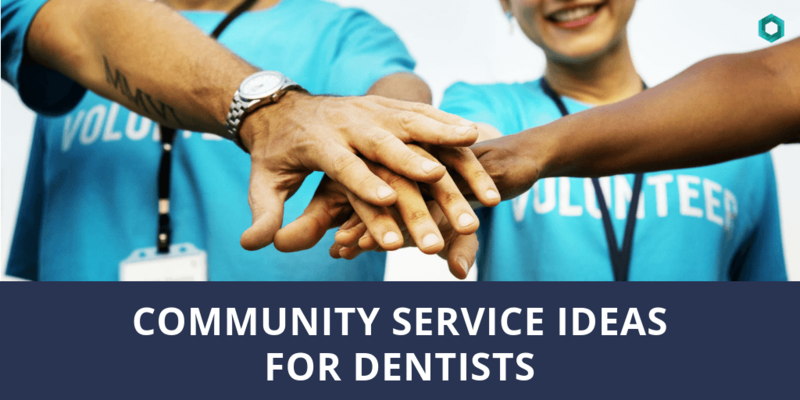 This is why we have gathered a small list of ideas to help get you and your dental team get excited and started about community service. As the saying goes, “children are the future”, which makes school visits with a focus on dental education a great idea for your practice to implement. It is no secret that children dislike going to the dentist, whether they are afraid, it makes the anxious or just because they don’t want to. By going to their classroom, a setting that is both familiar and comfortable for them, you have the advantage of showcasing the benefits of dental care, teaching them about the different tools you use, and learn more about you and your team through a fun, engaging and less intimidating manner. We know that it is important to implement a healthy dental care routine at a young age, as it can not only impact the long-term health of our smile but can hinder a child’s performance at school! Outreach to Administrators in nearby schools, schedule visits and make sure to pack goodie bags filled with branded materials such as a toothbrush, kid’s floss, stickers, pencils, tooth erasers, your business card (for the parents) and other little fun treasures. A great way to not only get your team members to participate but your patients as well, is by running a food drive our of your practice. With the holidays coming around, there are still many families in this nation (even in your own neighborhood), who are struggling to make ends meet and provide a warm meal for their own. Food drives collect canned and other non-perishable food items that can be held year-round. The first step would be to plan and organize your food drive properly, and establish how long you want to run the drive for. You can then promote your event on your social media accounts and put up signs on around the office to encourage your patients to bring in an item on their next appointment or at any time during open office hours. You can then connect with a local church or non-profit organization that will help you distribute your donations to families in need. If you rather get more hands on when it comes to feeding your community and put together a fun team-building event for the office, consider volunteering for Feeding America – they set you up with all of the tools needed to give back to your local community. Just apply and they will get back to you as soon as possible. The American Academy of Cosmetic Dentistry has a great program called “Give Back a Smile” which provides dental care at no cost to adult survivors of domestic and sexual violence who have received traumatic dental injuries as a result of the abuse. Whether you own a dental practice or a dental laboratory that can donate the laboratory work needed to help restore these smiles, you can sign up free on their website to be a volunteer for the program. They outline what to expect from these patients who have experienced trauma and the best ways to go about them as well. Another great and effective way to give back is by donating a portion of your treatment costs to a local or national organization that is near-and-dear to your heart, be it dental or not. For one month, you can promote that a portion of all dental cleanings or new orthodontic patient enrollments will be donated to an organization. At the end of the month you can then create a Facebook/Instagram live video making the announcement of how much you were able to donate, as well as thanking everyone in your community for helping you reach this business goal. You can take pictures and share them on the accounts so your followers can engage with you further. Whether you participate in any of the ideas listed above or come up with one of your own, remember, you have the gift of restoring smiles which can restore a life. What a beautiful feeling it must be to experience a patient cry tears of joy after seeing their new smile in the mirror and finally feeling secure about themselves or a family enjoying a Thanksgiving dinner thanks to your food drive. We have the ability to make this world a beautiful place to live in, not just for ourselves but for those around us. Share some of your ideas below of how you plan on getting your dental practice involved in community service.